Members of UofL's SGA were on hand, along with President Neeli Bendapudi, to unveil UofL's crest at the prestigious University Club in Washington, DC. On Wednesday night, the University of Louisville crest was added to the prestigious University Club of Washington, DC. 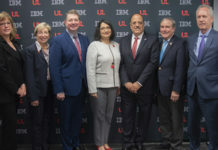 With a formal unveiling ceremony featuring members of the UofL Student Government Association, alums, Kentucky’s federal delegation and President Neeli Bendapudi, UofL became just the 34th institution to be honored with its crest showcased in the University Club. The first organizational meeting of the University Club was held in 1904 and included founders President William Howard Taft and Supreme Court Justice Melville Fuller, as well as a larger group of business and civic leaders who laid the cornerstone of tradition and excellence that continue to be hallmarks of the club today.